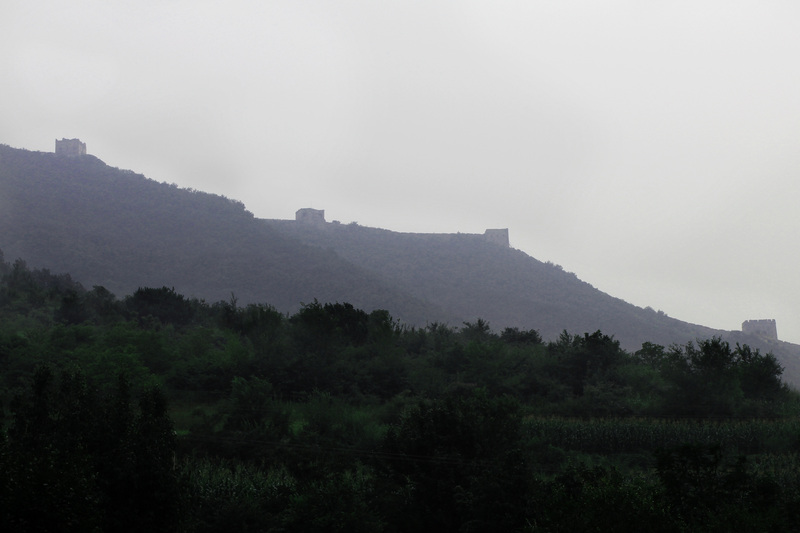 I once spent a long weekend hiking the Great Wall. Rather than traveling the most touristy part, we followed a “tour guide” who helped us to, shall we say, circumvent the Chinese authorities guarding the less maintained parts of the Wall. After a full day of scrambling up crumbling staircases and stepping gingerly on narrow pathways, we descended wearily from the Wall into a village. This village was made up of fields upon fields of corn with one-story houses scattered on the surrounding hillsides. The roads were all dirt and loose gravel, and at night, it was so dark and quiet that if you stared at the sky long enough, you could almost see the stars move and feel the earth turn. We drank warm beers because the weekly shipment of water hadn’t made it to the village yet and when the power went out after a sudden thunderstorm, we played Murderer in the Dark until finally, everyone fell asleep. I awoke to the quintessential crowing of roosters and stepped out into a grey, cool morning. Our hosts were awake and already busy preparing the day’s meals, but everyone else was still asleep. I wandered down the road, passing a graveyard of discarded couches, several loud and territorial chickens, and some angry (but thankfully chained) dogs. 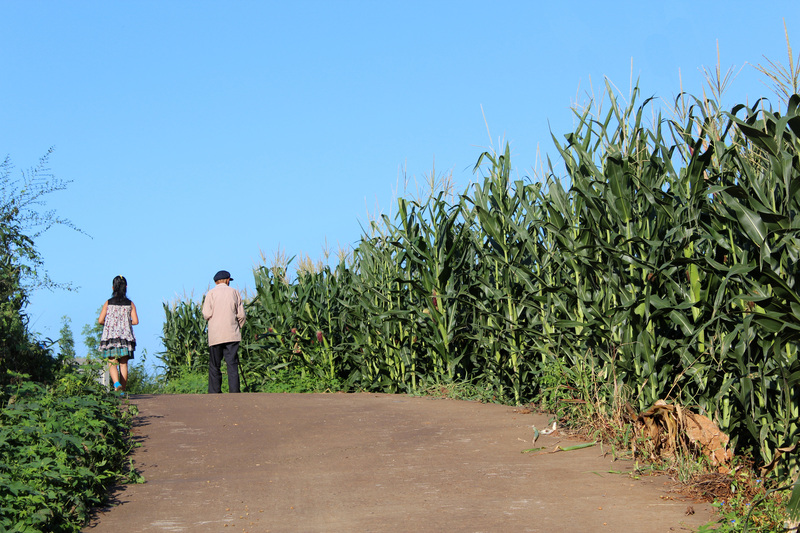 As I walked on alongside the fields of gently swaying corn, I came upon a young girl and an old man walking silently side by side. This sight isn’t so uncommon, especially in the Chinese countryside. 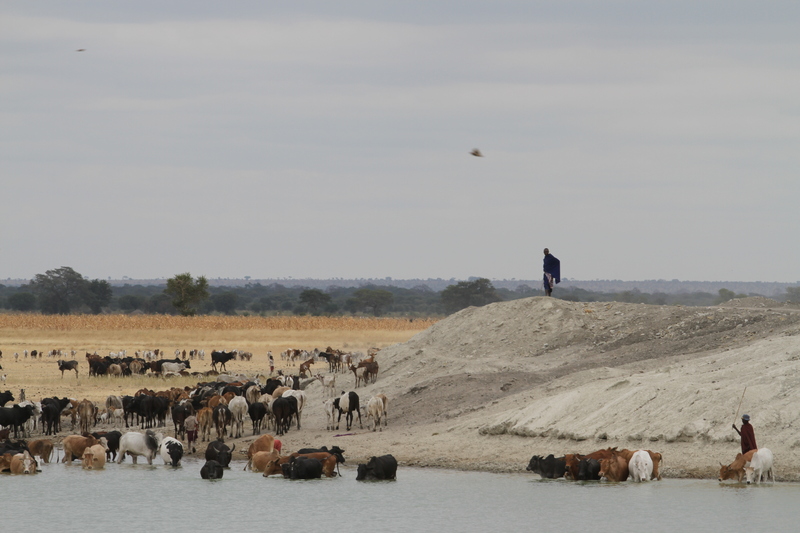 Rural villages have depopulated over the decades as young people leave for modernity and opportunities in the cities. After passing through the minority communities of Tibet (西藏) and Inner Mongolia (内蒙古) and talking with the people there, I learned the fear of these people that their culture and even language will be lost as the old die and the young leave forever. As the mist cleared, I walked back through the corn, past the still-ruffled chickens, and back to the house where everyone had since woken up. Our hosts placed a large pot of noodle soup on the table, made with fresh-picked tomatoes, hand-drawn noodles, and probably freshly killed meat. As it gets colder, I have found myself thinking back to that soup they made for us after a cold night (cold for summer at least) spent without electricity or running water. I remember their small dogs, their dented tables emblazoned with the “Coca Cola” logo. I remember how warm, how delicious, that meal was after a long walk on a damp morning. But I cannot remember the faces of our hosts. I always thought that it was the language barrier that prevented me from learning more about Chinese culture, but even after spending months in China learning how to speak the language, I learned very little about the people themselves. Now I wonder about the story behind that pile of couches, about our hosts’ small garden carved painstakingly into the hillside. We barely spoke to them except to say our thanks. We packed our bags. We hiked back up to the Wall. And so we became just another bunch of foreigners (老外) who had passed through their village, our tourist money merely prolonging the end. 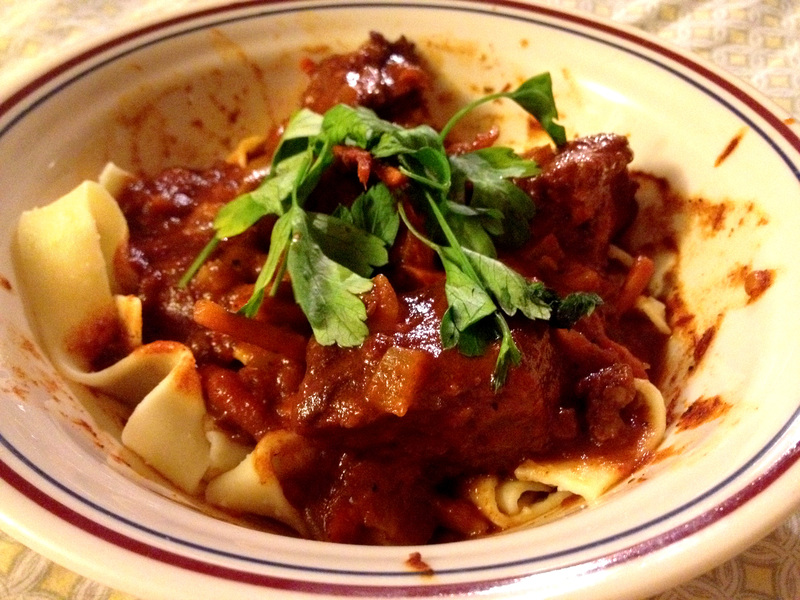 One of my friends traveled to Hungary this summer, and since then, she’s constantly raved about goulash. 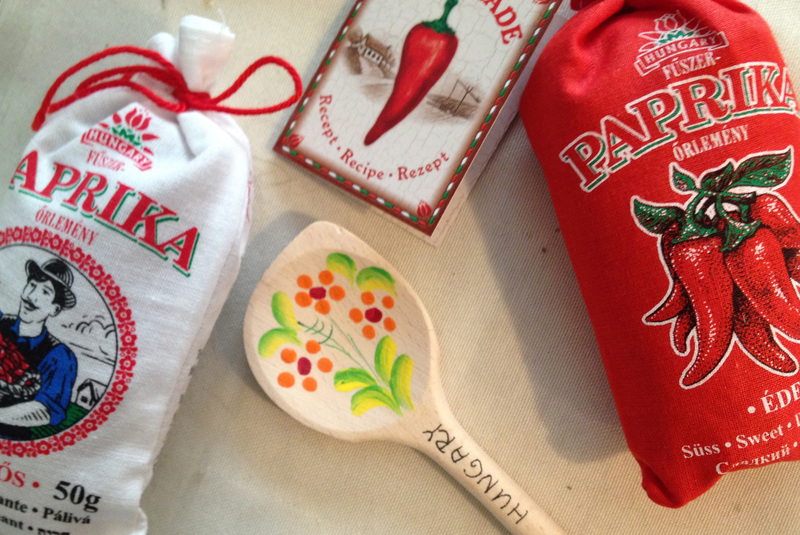 She even brought back some adorable sachets of Hungarian paprika (since everyone knows I’m kind of obsessed with Hungary) and requested that I attempt to recreate the goulash she had in Hungary. As I set out to make the dish, I realized while I have blindly followed recipes for dishes I’ve never tasted before, this was the first time that I was attempting to recreate another person’s memories. I searched “goulash recipes” and one of the first hits was Paula Deen’s goulash recipe, whose ingredients include soy sauce, Italian seasoning, and elbow macaroni – all of which I’m pretty sure are not featured in Hungarian cuisine, and all of which sounded eerily like American chop suey, a.k.a. the worst cafeteria food ever created. So I put the goulash project on the back burner and kind of hoped my friend would forget about it. For weeks, nothing. And just as I sighed relief, she brought it up again, and I knew that I had to at least try. Among all the so-called celebrity chefs, Paula Deen ranks pretty high on my “human joke” scale. The irony of getting diabetes after decades of decadent butter consumption (as well as her whole racism debacle) makes it difficult to take anything she does seriously. However, the Italian seasoning in recipe did give me an idea: I might not have ever experienced gulyás or pörkölt, but I had had excellent beef stews before, namely beef ragù. The recipe, a mix of familiar components and new flavors, began to take shape. Even buying the ingredients wasn’t easy – I rarely eat beef, so I basically went through the beef cuts and picked the one that looked the “meatiest” (I think it turned out to be chuck roast or something). Then I realized there’s marjoram leaves and there’s marjoram seeds – still have no idea what the difference is. After finally acquiring all the ingredients, I tackled the dish itself, and three hours and a few “experiments” later, I finally had something to put on the table. I looked anxiously at my friend as she took her first bite – I thought it tasted good, but would it taste right? She nodded her head. 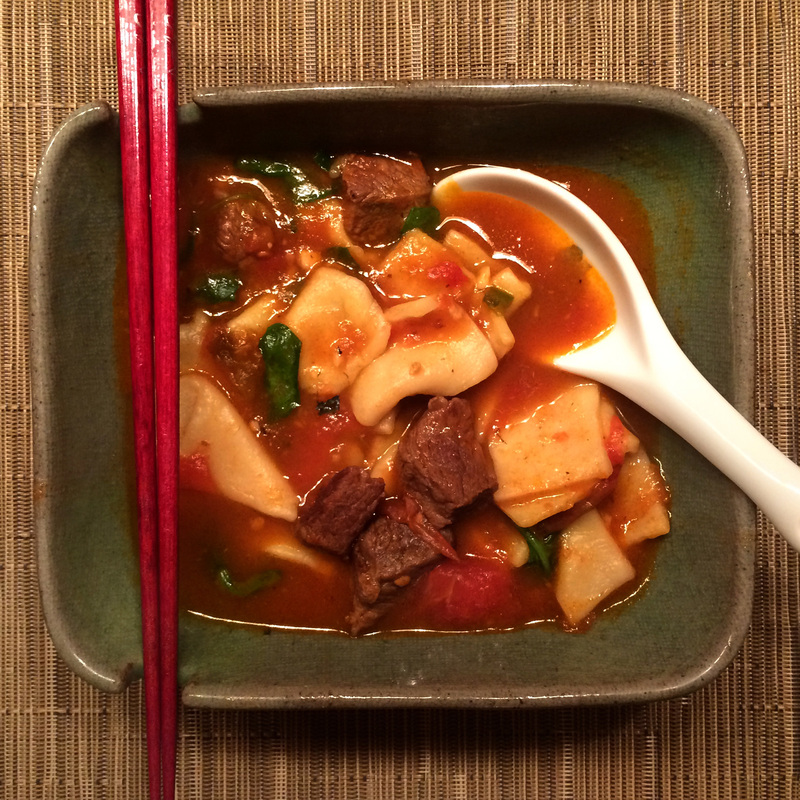 “Tastes like Hungary.” Recreating another person’s memory is a funny thing – I strayed from the “authentic” recipes and even ended up taking some inspiration from an unexpected source, all to chase after my idea of what she had experienced when she ate goulash. At the end of the process, I was glad to have taken on the challenge, and I hope that one day, I will be able to travel to Hungary and create my own memories of gulyás and pörkölt and all the other flavors of Hungarian cuisine. It has not been one year. Well, apparently it’s my blog’s one year anniversary. I feel compelled bake something cute to commemorate this. 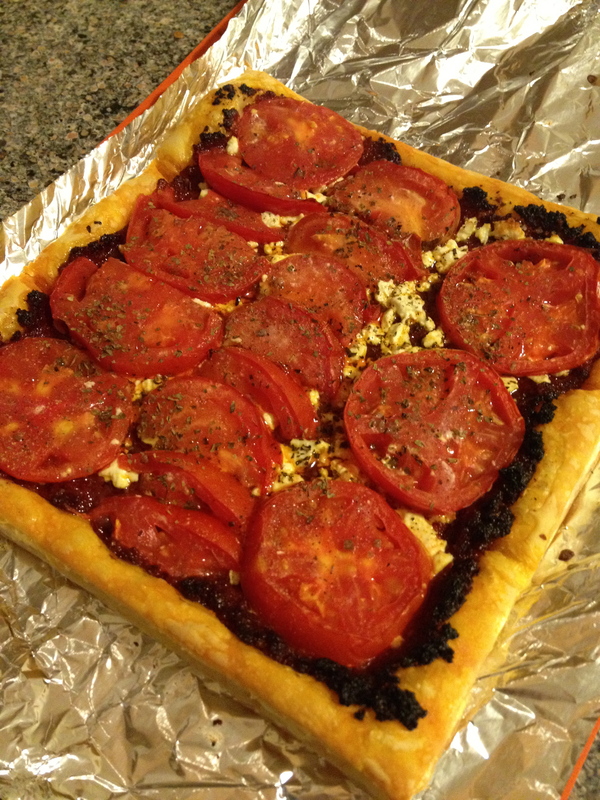 But for today, we’ll just have to make do with a tomato tart recipe. Don’t get me wrong, it’s a delicious (and super easy!) recipe, but if you know me, you know I like (to celebrate with) cake and everything sweet. 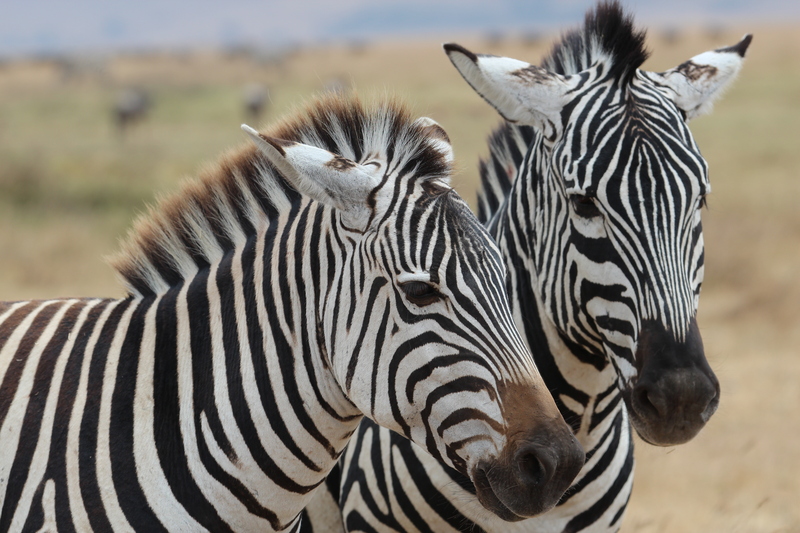 Zebras a.k.a. the most photogenic animals ever. Anyways, I’ve been thinking about my last post and what exactly I wanted to express. I felt some kind of unease in Africa, some embarrassment about my lack of cultural understanding, and guilt over what felt like exploitation of an entire country. Part of what I so ineloquently expressed is summed up beautifully by Spectra on her blog. Part of what Africa made me realize was that yes, I am privileged. There’s no pretending that I, and most people I interact with, are affluent. And by going to Africa and donating some small sums of money to schools, and giving large tips to the service, I wasn’t saving anyone. I wasn’t changing anything. It’s unfair how much Africa affected me, and yet how little I could do in return. But I can’t pretend otherwise. Another aspect of my discomfort comes from the fact that as an Asian, I’ve faced cultural appropriation, whether in the form of white people flashing peace signs in photos with me, people wearing kimonos at Halloween, or people asking me to say something in Chinese, as if I must speak Chinese because I look Chinese. I understand what it feels like to be the token minority, like some kind of trophy. And yet, in Africa, I felt that I was taking advantage of the Africans. When we visited the Maasai village, our tour guide specifically told us to visit because we would pity them. We sang and danced with them, but it was all just some show, done for each group of tourists that drove up to the village. We visited the house of a sick old woman. We heard her coughing, hidden beneath blankets in the darkness. We stopped by a school where children recited the ABCs. And we could do nothing. 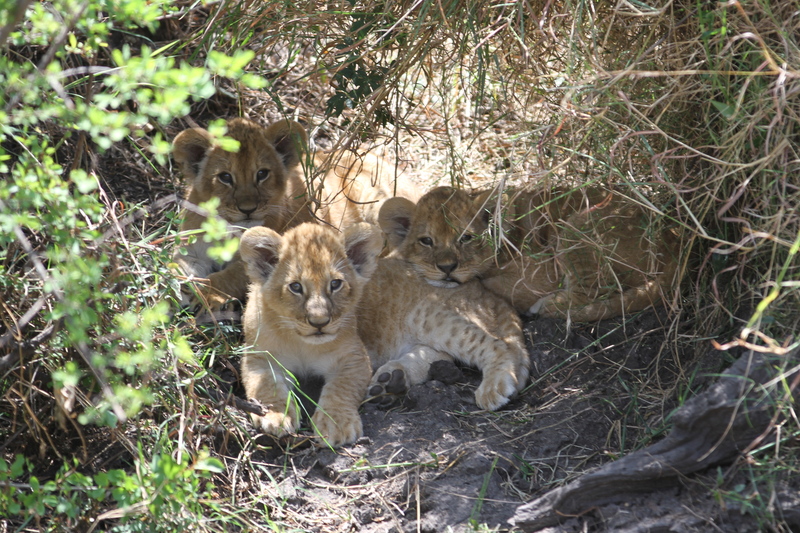 We were simply there to experience a neat little slice of African culture. 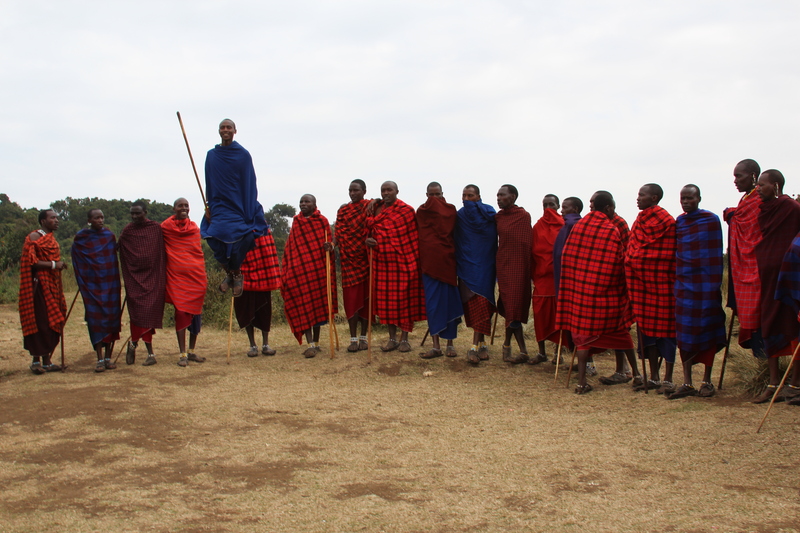 All the Maasai men could jump ridiculously high. I had always hated how people treated me like I was an outsider to mainstream American culture, how they always expected me to have different customs and speak a different language because I looked different. And yet, there I was, treating the Africans I met like they were some exotic oddity and feeling good about myself for giving them large tips. Exactly like some kind of Western savior. A month ago, I went to Africa for vacation. It was insane and unbelievable, so unbelievable that I look back now and wonder if the whole experience actually happened. It did, and I have the pictures to prove it. Part of the reason it all felt so unreal was because, in a way, it was. We experienced snippets of culture, stopping by a Masai village for an hour, singing and dancing with them, then returning to our hotel, a gated expanse with its own private plantation. The grounds were perfectly manicured, yet we never saw any workers in the fields. And every day, we’d drive around, searching for animals with all the other tourists, spotting elephants and leopards and beautiful birds. It was exhilarating. It was like Epcot and Animal Kingdom on steroids. While driving from national park to national park, we’d glimpse the Masai herding their goats and cows on red, dusty plains. We’d see people milling about, perhaps looking for work, perhaps not. Women carried bundles of twigs, bunches of fruits, and other large objects on their heads. Men sat outside furniture stores, which seemed to only sell beds. We’d see these people, and for a brief moment, we’d wonder where they were going, what were they doing. And then we’d leave them in the dust. Africa was beautiful. Everything was strange and new and incredible. Our guide, Godson, was deeply passionate about animals, describing the movements of different packs of lions, of three cheetah brothers, of the wildebeests. 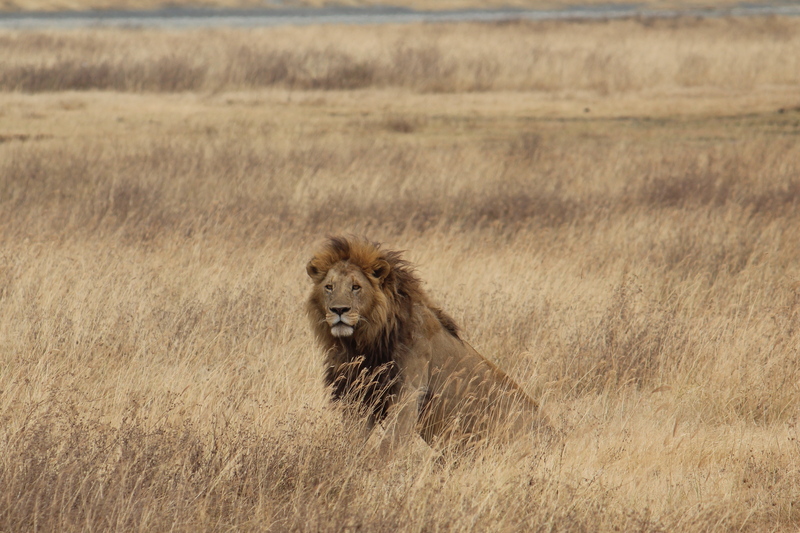 He knew the lions and cheetahs by sight. We searched for rhinos for two days, and long after our family had given up and fallen asleep in the back of the van, Godson and his assistant, Bohke, kept peering into the lengthening shadows of the brush. 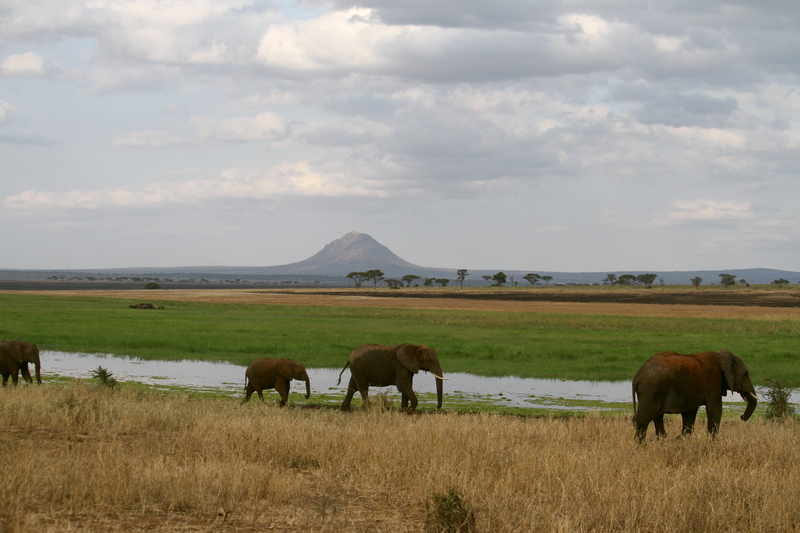 For a while, I felt like I hadn’t experienced the true Africa. I felt like a tourist in the worst sense, like I’d just come for the animals. But that would be a disservice to all the people who’ve dedicated their lives to the tourism industry, who work incredibly hard to make sure every one of their clients has a perfect experience. When my parents forgot their luggage at the hotel, we thought we’d never see it again. Pantaleo, the manager of our hotel in Serengeti National Park, called up a friend in Arusha to make sure the luggage was transported properly from Serengeti to Arusha to Zanzibar. For these people, the tourism industry is their life. Angel, our hostess at Tarangire, told us she only was able to see her son every two months. On one hand, we barely spent any time mingling with the populace in town, and learned about six words in Swahili. But the Africans we met in the hotels are not just some two-dimensional workers; they are people who made enormous sacrifices to enter the tourism industry and create a better life for their families. Two weeks in Africa taught me a lot, though it took me a while to realize it. After studying abroad last year, I had come to equate cultural immersion with the real experience, as if all other experiences were somehow simply superficial. I felt superior to other “tourists” in that I had interacted with natives, spoken their language, tutored their children, even lived in the same dorm as them. But this view is just as entitled as going to a foreign country and hiding in a walled resort, believing everyone outside the safety of the hotel is a pickpocket. There is no one real Africa. Countries and the people that populate them are multifaceted. In China, I learned to look down on all the laowai, to laugh at them as they got swindled in the markets. I owe it to Godson, to Angel, to Wilson and to all the other people who I met along the way for making me realize that by indiscriminately looking down on tourists, I was looking down on an entire sector of incredibly hardworking people. The tourism industry has heavily influenced many countries, from Greece to Africa to America. It cannot be ignored, and should not be degraded. 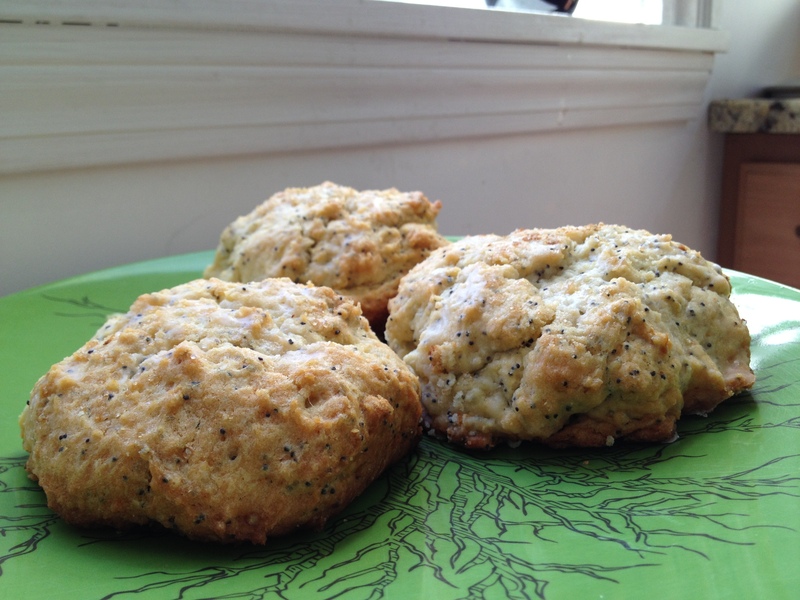 This lemon poppyseed scone recipe really has nothing to do with the post, but hey, it’s a tasty recipe. It’s refreshing and light, which I imagine would be a good change of pace after this wordy and somewhat heavy post.